Honestly pretty happy with how this album has held up for me. 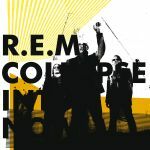 It's quite impressive for a post-Berry album and depending on how I feel about "Monster" or "Up" with more listens, I'd pretty safely slot this around 9th-11th as far as favourite R.E.M. albums go. Faint praise? They made a lot of quality albums in 1983-1992, but compared to "Around The Sun" & "Accelerate" this is practically a revelation.<br><br>It was not apparent that this was to be their final album when it was released, but it's a good stop off point I feel. Rarely descends into true mediocrity and just feels like there's legitimate passion in it. Just listen to the opening to "Discoverer" and hear the most lively R.E.M. have been in years. Also points for fooling me for years into thinking 'quirky' album track titles was just so their thing.